For anyone who has read Cory Doctorow’s Makers (and if you haven’t then I urge you to. It’s free under a Creative Commons licence) the idea of a self-replicating 3D printer will not come as a surprise. However, there is still something mind-boggling about seeing one in action and thinking through some of its potential uses. That was the treat in store for Dev8D participants today when Adrian Bowyer from the University of Bath demonstrated the RepRap. It’s a 3D printer that will not only print out plastic objects – from children’s shoes to doorhandles – but will also print out most of itself. As Bowyer says, “anyone with a RepRap can make one for a friend!” What’s more, as it is licenced as open source, under GPL, with all the instructions available online, anyone with a RepRap can make one for a friend for free and with their own modifications and improvements. The RepRap can currently copy about half of its own parts and the others (such as nuts and bolts) are almost entirely available from general hardware stores with a couple of specialist components needing to be bought online. At its print rate of about 19ml an hour, it takes around 2.5 days to replicate itself. It costs about £300. To put that in perspective, the cheapest commercial 3D printer costs over £10,000. On top of that, non-open source 3D printers only allow their own, branded plastic cartridges to be used – at an inflated price. And, of course, the machines do not self-replicate. And the potential for the end user, particularly if that user is in a developing country, is where it gets really exciting. At the moment, the objects people are making and sharing (see http://www.thingiverse.com) are interesting but are limited by the constraints of the material the RepRap can use (it works with a plastic, polylactic acid, made from starch). When the RepRap can deal with multiple materials, such as electronic components, the landscape will really open up. “One of the things about making stuff is that you need a lot of capital to make almost anything – it could cost thousands or millions of pounds to set up a screwdriver factory, for example – but a printer like this allows you to make them for a couple of hundred pounds. A small community could start putting a foot on the first rung of the manufacturing ladder and the ability to start manufacturing with low capital costs brings considerable benefits to the world’s poorest people,” says Bowyer. “As it’s all open source they can do it without spending a penny apart from the materials and nobody can take it away from them – it’s on the web and all over the planet and nobody can kill it off,” he adds. There will undoubtedly be some commercial interests who might be very keen to try to kill off the self-replicating 3D printer. Bowyer compares the impact that printers like the RepRap will have on the manufacturing industry with the effect new digital technology had on photographic film. The difference is that, in this case, it won’t be one industry completely replaced by a technical innovation but chunks of all industries that are affected. And what of Cory Doctorow’s point that “printing AK-47s is so much weirder and more interesting as a futuristic effect of the 3D printer than printing trademarked objects will ever be”? Is Bowyer concerned that he might have made a monster? This entry was posted in Uncategorized on February 25, 2010 by Michelle Pauli. ..Which is also licensed under the GPL, but can’t replicate itself. 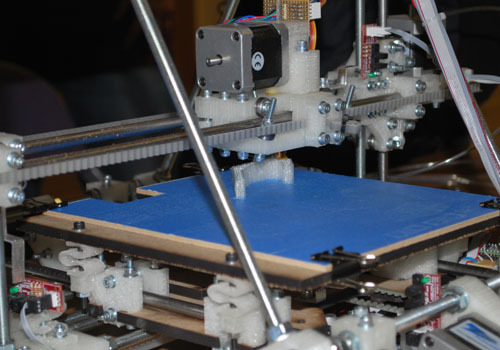 It can however print one of those Mendel Reprap printers Bowyer demonstrated. A Makerbot costs as little as $750 if you provide your own power supply, but the more practical option (Called the “Deluxe Kit”, which comes with everything and extra plastic) costs $950 dollars. The support community is fantastic, too. Its extreme inefficiency (3 days to make half of its own parts) makes it suitable only for prototyping. Cheap prototyping is a very valuable use but that is not the same as mass production of consumer items or tools. Its the economics, because time is money. To take the example of the screwdriver. With China producing them for pennies why would the African villagers go to all the trouble of Reprap in order to just produce the plastic handles (and they still need other methods to make the metal part). The mainstream manufacturers don’t have anything to worry about. They may be interested in Reprap as a prototyping tool, but then again why would they do that when they would probably already have turn-key commercial prototypers with the support that goes with them? @Heuristics While it is true that this machine can only replicate half of its parts so it cannot truly replicate itself, the rest of your response lies on an incorrect assumption. Time is not money. It is merely measured that way by industrial management in order to quantify labor resources. It may be a good way for business to think about “time” since it allows for analysis to increase allocative efficiency; however, it is a terrible way for humans to perceive their own time. To take the example of screwdrivers, communities in Africa may produce them with this machine if the material to make this at hand is significantly cheaper than sourcing them from China, or that it allows greater autonomy from depending on China for their industrial base. However, I am not sure I would want to use a screwdriver made from this material. It might break too easily. On the other hand, if it breaks, I should be able to make more of them. If the material can be recyclable, that is even better. I also agree that mainstream manufacturers don’t have anything to worry about … right now. They have a lot bigger issues on their plate, for example, the relocation of these manufacturing plants into China. During the high price of oil during the 2007 – 2008 years, US raw materials factories had revenue increases because the cost of transportation grew high enough that it was easier to source these materials domestically. In generally, they have had to change their business model to making specialty material, depending more on technology rather than low costs. Technologies like the RepRap will not win on efficiency. To use the models collected in the book, “From Poverty to Prosperity”, RepRap loses on “allocative efficiency” and wins big on “adaptive efficiency”. Prototyping only scratches the surface since that use case requires very high adaptive efficiency. Further, decentralization of industrial resources decouples the processes from each other. For example, the engineers who built the web platforms such as Amazon’s infrastructure have found that it is better to decouple the major parts and design things to be stateless. Being stateless avoids the need to check back with a central command and control center. There are more errors, yet the recovery tends to be faster, and the whole infrastructure tends to be more resilient. 2. Time-to-build is trumped by the potential for exponential growth. To see the potential, you have to suspend the current mass-production mindset. Just because it cannot make all of its own parts does *not* mean that it cannot replicate. This is really an awesome post. Thanks for the share.